I was really excited today, because it was Goat Farm Day!! Our team was taken to see a newly established goat farm that will mean provision, income and long term sustainability for a community. It will also mean healthy nutrients for infants and a long list of other things...that story will have to wait for another day. 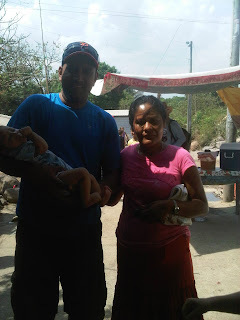 Last October a lady in the village of San Antonio, had given birth to a little boy. The story of the child-birth was somewhat amazing and the details I don't necessarily recall at this point. But she, Tomasita, did share her story in church while the SEMC team was there. Then they called me up to pray for the child, to dedicate him to the Lord. Together we all prayed. It's one of the perks of carrying the title of "pastor" and I love it!! But it was more than a dedication, it was also a prayer for healing...the boy, Adrial, was born with an enlarged heart and the doctors weren't optimistic on his long term health or life. It would be wrong to say that our prayer on that night brought healing...just two weeks ago, Tomasita returned excitedly from the doctors with the news that Adrial's heart was normal! There was no medical explanation for it...it was, they say, a miracle!! We don't always get to hear how the Lord answers our prayer. We don't always see the results that we might timidly pray as we summon a kernel of faith to speak words that seem impossible. Today, I am reminded that God is bigger than my capacity to verbalize a prayer. He is greater than medical expertise and He is gracious enough to allow me the privilege of holding a real live miracle - twice. This is now my fourth trip here in two years. We first came to build houses, but over time and consistency we have developed relationships. These trips are not about houses, but about people growing in their understanding of the Kingdom of God at work among them. Today we saw that in the unmistakeable smile of a six month old boy. So I share this with our team who was here in October of 2011. I share this with those who have developed relationships over the last four years. I share with a church family that encourages me to see and experience what is going on in the global context of God's Kingdom work. Thanks for blessing this community with your support, generosity and prayer. God is good! Great to hear about this miracle. We are commanded to pray and it is great when you see the results of those prayers. Did we mention it was HOT!